EWPN is a non-proﬁt membership organisation whose purpose it is to promote gender parity with respect to opportunity, reward, recognition and professional mobility. EWPN seeks to achieve the same with respect to ‘diversity’, be this term in reference to inter-sectionality, race, ethnicity, sexual orientation/identity or creed. A major part of EWPNs funding and ability to stage events rely on corporate sponsorships. Partnership sponsorship: These sponsorships are broad in nature and they are intended to provide the sponsor with broad and prominent brand exposure at all EWPN events, publications and These partnerships are ﬂexible and open to bespoke arrangements and agreements in order to provide mutual beneﬁts. Event sponsorship: These sponsorships are typically tied to an event or a series of events, where the sponsor gets speciﬁc brand exposure relative to an award or function at an EWPN event, or to a speciﬁc topic that EWPN runs in one or more. The partnership sponsorship is valid for a year (12-month rolling) and event sponsorships are valid for one event or a series of events within a year (12-month rolling). 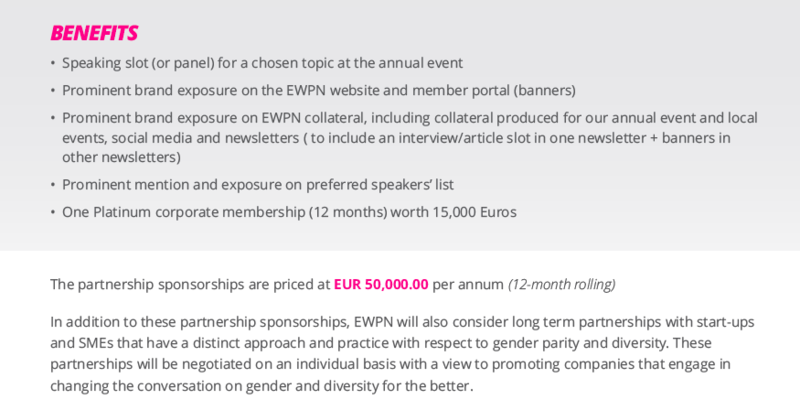 EWPN will seek to have sponsors for two types of events, the annual event conference dinner and awards and speciﬁc topic events, e.g. leadership clinics, throughout the year. local meet-up events are sponsored locally in the country where they are taking place. Preceding the dinner and awards gala event will be two leadership clinics and at least an additional clinic on a speciﬁc commercial topic. These clinics will oﬀer opportunities for companies to sponsor speciﬁc topics that EWPN will put on the agenda. EWPN will aim to hold clinics throughout the year in conjunction with partners and local, in-market, meet-ups. These sponsorships will be sold at EUR 5,000.00 each. These will provide a very speciﬁc brand exposure for sponsoring companies, as well as a speaking slot at the clinics, which are a very good opportunity to showcase company initiatives and/or take a position on a topic. EWPN seeks to be a leader in creating and disseminating evidence-based research on gender and diversity dimensions with a speciﬁc focus on the payments and FinTech industries. The focus of the proposed research is aimed at examining the value of gender parity and diversity with respect to innovation, productivity, talent management, product development, sustainable growth and value creation. EWPN believes that insights through research are crucial to promoting a progressive agenda for gender parity and diversity in the payments industry and in our societies. research in collaboration with companies and academia is likely to yield valuable results that EWPN and its stakeholders and members can use to promote the EWPN objectives and educate and advocate in line with research results. EWPN aims to develop a strong and collaborative network of research, be that original or curated research, with like-minded organisations, academia and business schools. EWPN will be seeking speciﬁc sponsors to fund research undertaken in the EWPN research programme. This programme is supervised by qualiﬁed researchers at PhD level. Insights and research sponsors will have an opportunity to provide input in to the research topics or select topics from EWPNs priorities. The insights and research sponsorships are priced between EUR 5-25,000.00 per annum or per project. By associating your company and brand with this EWPN you can gain direct access to attending senior representatives from leading and renowned players in fintech & payments industries.Sponsorship is possible on multiple levels.